John Kelly took over as President Donald Trump's chief of staff in July 2017 and has led the White House through a tenure that included a summit with North Korean leader Kim Jong Un and wide-ranging tax cuts that the GOP hoped would help Republican candidates in the 2018 midterm elections, but didn't prove decisive. 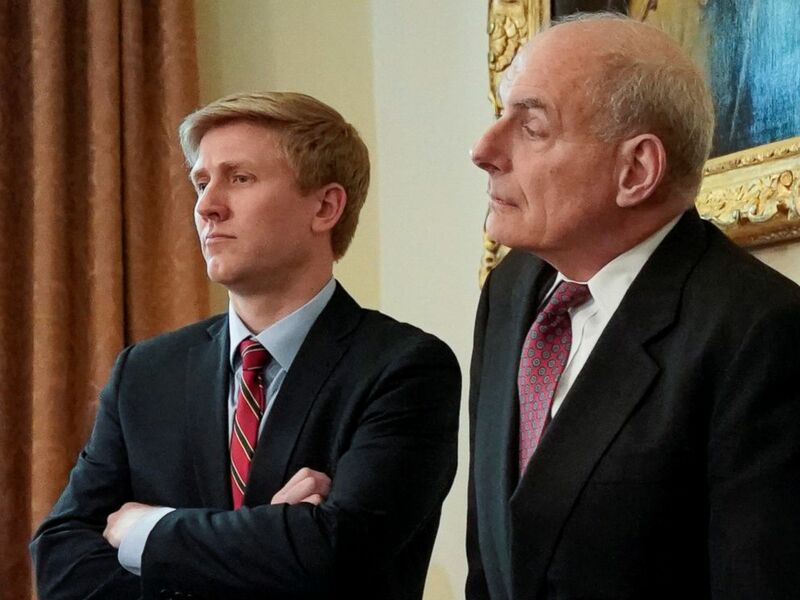 Just a few months ago, Trump asked Kelly to stay on as chief of staff through his 2020 re-election campaign -- a proposition Kelly accepted, according to several White House officials -- although on Dec. 7, sources confirmed to ABC News that Kelly was likely to be replaced in the coming days by Vice President Mike Pence's Chief of Staff Nick Ayers. During Kelly’s time at the White House. there have been frequent rumors around Washington that his efforts to stabilize and exert control on the West Wing created tension with the president. Speaking at Kelly's swearing-in ceremony, Trump said he believed Kelly would "do a spectacular job, I have no doubt, as chief of staff." Trump selected Kelly to replace Reince Priebus, who served as chief of staff for six months and was formerly the longest-serving Republican National Committee chairman. Kelly, a retired Marine four-star general, formerly served as the secretary of the Department of Homeland Security, confirmed on Jan. 20. "I have been fortunate to have served my country for more than 45 years - first as a Marine and then as the Secretary of the Department of Homeland Security. I am honored to be asked to serve as the Chief of Staff to the President of the United States," Kelly said in a statement responding to the new position over a year ago in July. He also thanked those he worked with at DHS. "To the tremendous men and women of DHS, I thank you for the opportunity to serve as your Secretary. When I left the Marines, I never thought I would find as committed, as professional, as patriotic a group of individuals. I was wrong. You accomplish great things every day defending our nation and I know your exceptional work will continue," Kelly said. He was the commander of U.S. Southern Command and a four-star general before he was confirmed as the secretary of homeland security. As head of SOUTHCOM, he was responsible for Guantanamo Bay and all U.S. military operations in South and Central America. At his retirement earlier this year, he was the armed forces’ longest-serving general. Kelly enlisted in the Marine Corps in 1970. His first military deployment was to Guantanamo Bay in 1971 when he was just 20 years old. He graduated from the University of Massachusetts before returning to the Marine Corps and working his way up the ranks, with stints on aircraft carriers, in the nation's capital and at Camp Pendleton in California. In 1999 he served as the special assistant to the supreme allied commander in Europe, one of NATO's two strategic commanders. By 2002, he was promoted to brigadier general and served — mostly in Iraq — with the 1st Marine Division as the assistant division commander. After three years as a legislative assistant to the Marine Corps commandant in Washington, D.C., Kelly was promoted to major general and returned to Camp Pendleton to command I Marine Expeditionary Force. During his deployment in 2008 to Iraq's Anbar and western Nineveh provinces, he was a key military player in what became known as the Anbar Awakening, which temporarily reduced sectarian violence. Kelly commanded Marine Forces Reserves and Marine Forces North before becoming the head of SOUTHCOM in 2011. Kelly is a Gold Star father. His younger son, Marine 1st Lt. Robert Kelly, was killed by an improvised explosive device in Afghanistan in 2010. He has spoken movingly about the loss of his son and about how little some Americans know about the sacrifice of service members. “Those with less of a sense of service to the nation never understand it when men and women of character step forward to look danger and adversity straight in the eye, refusing to blink or give ground, even to their own deaths,” Kelly said in a Veterans Day speech in 2010. As secretary, he was a proponent of the president's travel ban and implemented new regulations for laptops on planes in passenger carry-ons -- a ban that was recently lifted. He first met with Trump, then president-elect, on Nov. 20 at a Trump-owned golf course in New Jersey and was the second general selected for the Cabinet after retired Gen. James Mattis was chosen for defense secretary. As secretary for the Department of Homeland Security, established in 2002 in the wake of the 9/11 attacks, Kelly dealt with issues like immigration, border security, domestic terrorism threats and cybersecurity. Kelly traveled twice to Mexico as secretary of homeland security, most recently in July, where he met with President Enrique Peña Nieto and other senior-level officials. He also traveled to Jordan and Saudi Arabia to discuss security issues with his majesty King Abdullah II of Jordan and Saudi Crown Prince and Minister of the Interior Mohammed Bin Nayef Abd Al-Aziz Al Saud. He met with other leaders from Canada, Costa Rica, Honduras and Haiti during his time as secretary. As chief of staff, insiders said his tenure would be remembered for stabilizing the ship and steering the presidency through historic times, from a summit with North Korea to contentious trade disputes with allies to legislative battles over health care and tax cuts. ABC News' John Santucci, Jonathan Karl, Devin Dwyer, Katherine Faulders, Cheyenne Haslett and Dylan Wells contributed to this report.